True cost assessment considers the entire life of the floor. In the largest and most expensive construction project in school district history, Middletown, Ohio has completed a new 135,000 sq. ft. middle school and renovated an adjacent high school, both on schedule and within budget. The $96 million project is the most visible part of a new “Middie Modernization Movement,” which details comprehensive reforms to improve both infrastructure and academic quality across the district. “We used to have an awful lot of spaces that we couldn’t use for learning. They were dark, they were cold, just inoperable. We ended up with a product that was far better than we could have ever asked for. [Now students] can take initiative for things. They can make things actually come to life for them,” said Camela Cotter, Principal, Middletown High School. The new buildings feature some of the most digitally enhanced classrooms in the region, open air learning pods, improved building security, upgraded kitchen/ cafeteria, and a 200-seat community room to accommodate school and local organizations. A new elementary school project is also being launched to feed this new concept high school and middle school. In classrooms, modular carpet was selected to improve acoustics, while still allowing caster chairs to roll freely. Tarkett’s ethos® Modular with Omnicoat TechnologyTM allowed for glue-less installation using TarkettTAPETM, which minimized chemical washing and drastically reduced abatement costs in the existing high school. A delicate balance of requirements. Of course, the multi-phase, multi-year project was not without its challenges. In addition to coordinating all the moving parts of each phase, the team struggled with the way the typical Design/Bid/Build process drives material to the lowest price, according to Interior Designer Brandon Biniker of Fanning Howey. “The owner embraced the quality of design and products, and understood that finishes were integral to the success of the project in supporting the learner and the space,” said Biniker. With this support, the team gave special attention to design, durability and ease of maintenance in its specs, while considering ease of installation within overall project costs. “We wrote strong specifications to allow apples to apples comparison and maintain quality, lasting finishes,” said Biniker. In classrooms, modular carpet was selected to improve comfort and acoustics, while still allowing caster chairs to roll freely. Tarkett’s ethos® Modular with Omnicoat Technology™ allowed for glue-less installation using TarkettTAPE®, which minimized chemical washing and drastically reduced abatement costs in the existing high school. “Tarkett brought forward a product that put everyone’s fears at ease, and at the same time, had faith in that product,” said George Long, Business Manager for Middletown City Schools. Of particular value to the maintenance staff is their ability to quickly swap out stained carpet tiles for clean ones. “We can provide good, clean customer service because of the product Tarkett brought to us,” added Long. Visual design inspires community pride. Biniker and his team created a bold aesthetic that visually represents the exciting changes taking place throughout the district, and helped them bring fun and energy back into the spaces. 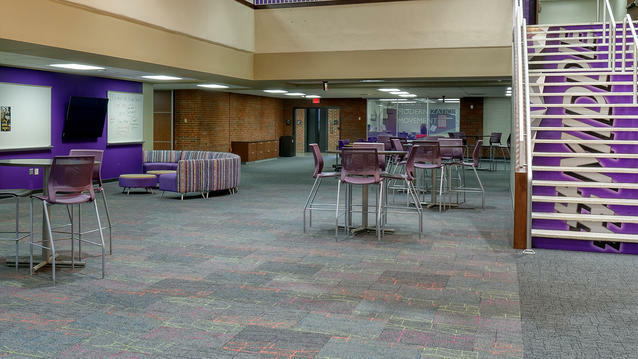 By customizing standard carpet designs to include the district’s cherished Middie purple, flooring choices set the scheme for the building and all other finishes, including wall colors and furniture. “As you walk this campus, it breathes Middie pride. You see pride written all over this building. You see focus on potential. You see positive environments where students feel excited about coming to school,” said Marlon Styles, District Superintendent. A state-of-the-art education facility designed for students from pre-school to twelfth grade, the Green Valley Ranch campus opened its doors for school in August 2010.